Back in March 2015 I posted a review of James Rickards’ book “The Death of Money”, which was published in 2014. In that book, Rickards presented a fascinating and frightening review of the current Global Financial System and outlined the inherent dangers of Fiat Currencies. Recently I have started following James Rickards on Twitter, and have therefore been inspired to read more of his published works. 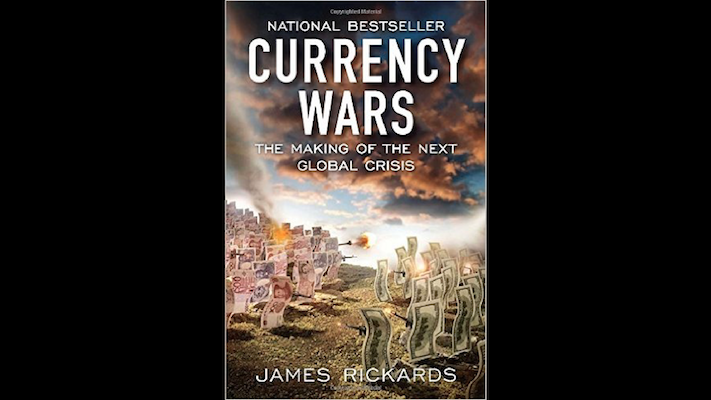 I have just finished reading both “Currency Wars” which Rickards published in 2011, and “The New Case for Gold” which was just published in April 2016. I will post my review of “The New Case for Gold” in the coming days. James Rickards has degrees in both Law and International Economics, and has more than 35 years of experience on Wall Street. He was the General Council for the infamous hedge fund Long-Term Capital Management (LTCM) and had a front row seat to witness the collapse and bailout of LTCM. He was the principal negotiator for LTCM with the Federal Reserve Bank of New York. In “Currency Wars” Rickards does an excellent job of presenting the history of gold backed currencies, fiat currencies, and the objective historical evidence for the safety and stability of prudently managed gold backed currencies. He provides a very solid historical perspective to understand and interpret the relative advantages and disadvantages of gold backed and fiat currencies, and relates this historical evidence to current day events. In a particularly enlightening, sobering, and frightening section of the book, Rickards introduces and explains Behavioral Economics and Complexity Theory. He defines a complex system as a system that includes “spontaneous organization, unpredictability, the need for exponentially greater energy inputs and the potential for catastrophic collapse.” He describes a Swiss watch as being complicated, having many gears, springs, jewels, stems, and casings, but a Swiss watch is not Complex. As a comparison, he describes human consciousness, which is an emergent property that arises out of a complex combination of organic elements. Central Bankers and economists have not yet embraced Complexity Theory, and instead continue to rely on equilibrium models, confident in their ability to calculate and manage predictable outcomes. However, since markets are not merely complicated, but are truly complex, they are fully capable of, and have frequently demonstrated, spontaneous organization and unpredictability, and periodically end in catastrophic collapse. “Currency Wars” is a fascinating book. I highly recommend it to anyone seeking a better understanding of our Global Financial System.